Grading on a bell curve is quite possibly one of the biggest abuses of the curve (next to measuring IQ). Some proponents argue that grading on a bell curve fosters competition – however, we get away from the point of education and the focus of the exercise at hand becomes competition rather than appreciation of the subject matter itself. Teaching, is sort of like therapy in that it is a direct intervention and the best result finds that everyone is excelling. 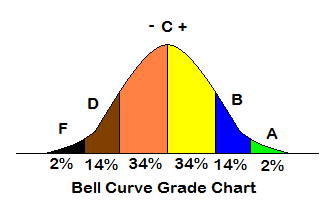 In bell curve style grading professors believe that we should have a few but equal numbers of A’s and F’s, more but equal numbers of B’s and D’s, and more C’s. Using the grading curve encourages students to focus on the rewards of learning (extrinsically motivated) rather than the personal satisfaction of learning. Even if students do well in these classes they don’t attribute their success to their own knowledge, they attribute it other’s poor performance. The American Society for Engineering Education says that grading on a curve – or left of center grading is common in engineering curriculum and is actually quite harmful. Students don’t know their standing in the course until the end of the semester. Lack of information upfront can cause ill-informed enrollment decisions, not to mention a bunch of undue stress. Some faculty members argue that it’s character building or a way to build coping skills, sure I could see that. Maybe, in a parallel universe where character building involved the complete destruction of one’s character. They rationalize it based on the fact that, “I’ve done it, everyone else has done it, so you should do it too.” I mean, it really is a bummer for you that you had teachers that didn’t care (or didn’t have time) to reevaluate their teaching methods to see if maybe something else would work better. If my students are consistently getting 30% on exams that means they are not comprehending the material. Instructors certainly shouldn’t be setting traps for their students in their classes that are designed to make them [the instructors] feel better about themselves while simultaneously tearing down the students. Otherwise we’ll have egotistical, competitive academics…. oh wait. If this philosophy were applied to a drug treatment program or some other form of direct intervention we would have an equal distribution of people committing suicide as we do succeeding in a treatment program. I believe that if you teach well, organize your courses, and intervene as soon as you see students start to slip you should see less distribution in your student’s grades. I want my students to learn and to learn well – no student should have a normal curve imposed on them. This entry was posted in PFP15F. Bookmark the permalink. You do a good job conveying your tone in your writing (ha). All kidding aside, I appreciate your disgust with grading on the bell curve. I’m taking a class right now in which the average test grade (over the past 3 tests) is hovering right at 50%. Nearly a third of the class has withdrawn from the course because the professor isn’t curving grades until after the final exam. The tests are so difficult, even a “C” seems un-achievable. This discourages students from wanting to study the subject matter because the professor refuses to change his testing style. The result: the students don’t learn the subject matter yet will get a passing grade (due to the curve). Worse yet, students’ grades won’t reflect the professor’s poor teaching, and since the students receive a decent grade, they feel less compelled to give the poor SPOT evaluation the professor deserves. So, I guess I decided to rant with you.